Product prices and availability are accurate as of 2019-04-14 11:25:38 EDT and are subject to change. Any price and availability information displayed on http://www.amazon.com/ at the time of purchase will apply to the purchase of this product. - 2 interior holder sleeves help keep your bottles from tipping over and smashing other items in the bag. 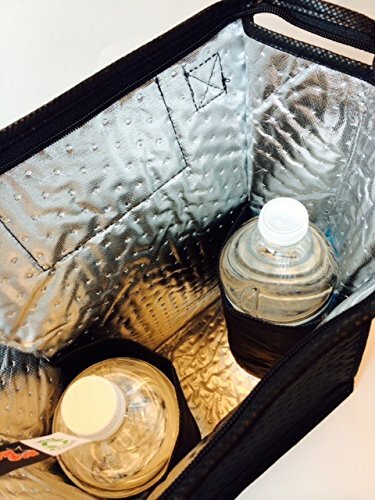 - Our Lunch Box for Adults has two side pockets roomy enough to hold extra drinks, snacks, utensils, wet wipes, etc. The exterior business card/name tag holder easily identifies your bag at the office or school. - Versatile, multi-use bag can be used as a water bottle or wine bottle carrier stashed with sandwiches, snacks, or cheese. 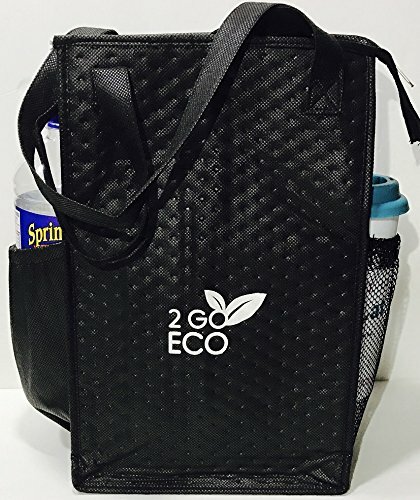 Perfect for outdoor activities such as picnics, concerts, tailgating, and camping, this lightweight bag also doubles as a convenient mini-diaper bag for moms or dads. - Side gussets expand when in use and fold in when empty for compact storage. Our USA-based Mom & Son company offers a no hassle 100% guarantee refund policy. If you use our Insulated Lunch Bag and do not love it, simply return for a full refund, even used. Add one to your cart today, and consider picking up another as a gift for a friend! 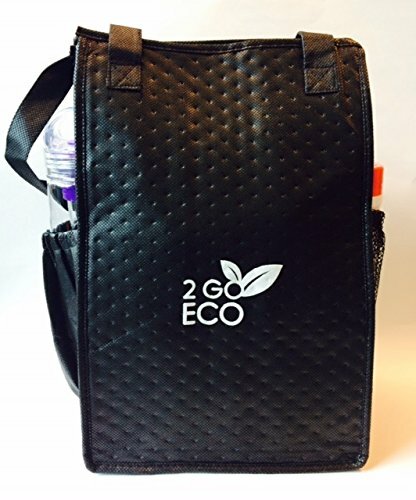 2GOECO Reusable Insulated Tote is the most versatile eco-friendly bag available! 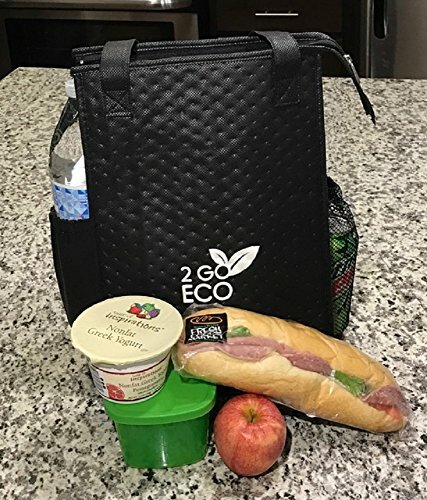 Lunches, mini diaper bag, wine tote- dozens of uses! 14" tall -holds large bottles with 2 interior bottle sleeves to keep items secure. Plenty of room for lots of other items too! Urban design makes this reusable insulated tote with zippered top closure ideal for anyone of any age Lightweight, durable 14"x9"x7" large capacity non-woven fabric bag holds up to 12 cans, plus 2 side pockets for extra storage Shopping, travel, lunch, diaper bag- this one can do it all! Get several Reusable Insulated Totes today!